The species grow in various South East Asian countries and are know as Meranti, Seraya or Lauan, depending upon their origin. 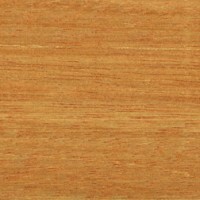 Meranti is the commonest name in the United Kingdom and the type most used is the red group. Most of it is light red or pinkish in colour, the average dry weight is 550 kg/m3 but it may be as low as 400 or as high as 705 the dark red material is at the upper end of this range. Because of the mixing of colour and weight some care may be needed in selecting pieces to match each other. Light Red Meranti is light red to pinkish-brown when freshly cut. The texture is rather coarse but even, the grain varies from straight to interlocked and stripe figure is often present. Gum canals are often present and may show as whitish lines on planed and sanded surfaces but the gum is white and crystalline, not sticky. The wood takes stains and finishes well. This type of Meranti is used for joinery, panelling, louvre doors, furniture, light construction and plywood. The timber is sometimes confused with African Mahogany and may be called Philippine Mahogany because of this resemblance. The other types of Meranti (Dark Red, Yellow and White) all tend to be heavier and perhaps more suited to structural uses, but they may also be used for the same purposes as Light Red Meranti.